Extra Large pop up and more stylish than others on the market today it definitely looks the part with eye-catching. It measures 4m x 4m and has a smooth tan coloured, painted steel frame making it sturdy and strong. 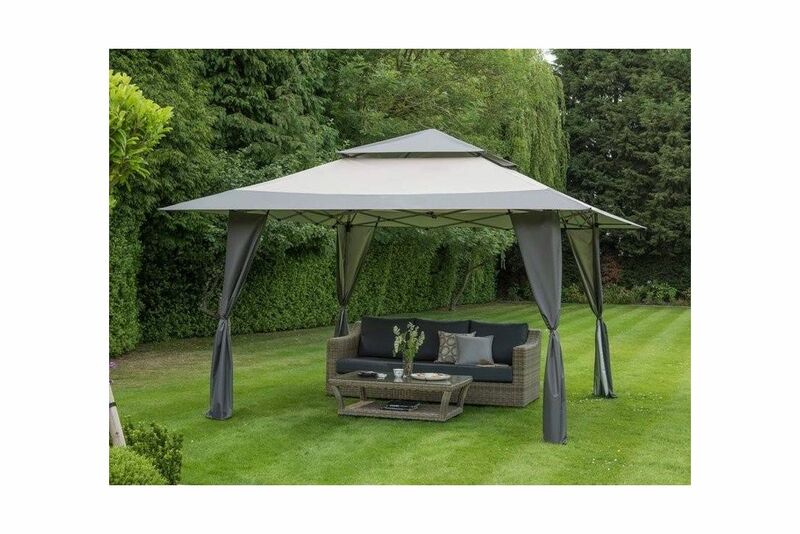 It has a heavy duty, water resistant canopy which comes in two shades of grey to complement your garden or outdoor space. The canopy also has UV stabilisers to help keep its colour in direct sunlight. The side curtains can be tied away neatly to the frame when not in use. The vented top section on the canopy allows air to pass through it and also adds a little decorative appeal. recommend that canopies are anchored securely but we advise that the gazebo should be taken down if strong weather is predicted.